Subject: Will Yahoo Sell Its Internet Business? A report from The Wall Street Journal last night (Tuesday) has investors asking one important question this morning: Will Yahoo sell its Internet business? In the report, the WSJ stated that Yahoo! Inc. (Nasdaq: YHOO) will have a series of meetings this week discussing the potential sale of Yahoo's Internet business. The meetings will also host discussions on how to gain the most from its stake in Alibaba Group Holding Ltd. (NYSE: BABA). You see, CEO Marissa Mayer hasn't created significant shareholder value over the last several years. The reason the YHOO stock price has doubled since she's been there is mostly due to the company's stake in Alibaba. When Mayer first took over Yahoo in July 2012, the YHOO stock price closed at $15.84 on July 31, 2012. Yesterday, the Yahoo stock price closed at $33.71. Mayer has attempted to provide value to shareholders beyond Alibaba. Mayer invested in online video and even hired famous journalist Katie Couric as the Global Anchor for Yahoo News. Hiring Couric was Mayer's biggest attempt to reduce Yahoo's dependence on lagging home page traffic, according to the WSJ. The results aren't clear as to how effectively Mayer's bets on Couric have paid off, but the CEO decided to increase her salary from $6 million to $10 million in June, nevertheless. According to a report from Re/code, Mayer told top executives that they had to make a commitment to stay with the company for three to five years verbally or in writing around August and September. Yahoo's most recent loss was Development Chief Jack Reses, who joined Square Inc. (NYSE: SQ) in October. 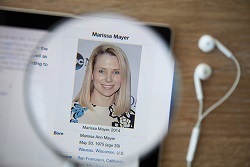 Over Mayer's reign, there has been nothing to suggest that she will unlock further YHOO shareholder value, and activist hedge fund Starboard Value is breathing down Mayer's neck.